Careers | Maxim Roofing Co.
WHY WORK WITH MAXIM ROOFING COMPANY? At Maxim Roofing Company, you’ll join a team that’s been focused on providing unparalleled service to the roofing industry for more than 20 years. Family-owned-and-operated, we strive to stay true to our roots in the Miami Valley. We’ve successfully grown our business while living out our core values and maintaining high ethics. Our commitment to both employees and customers alike, has helped us build a reputation of providing the highest quality products and customer service. We specialize in every type of roof, both residential and commercial — and have extensive experience in shingles, single-ply flat roofs, metal standing seam roofs, gravel surface built up roofs, modified bitumen and more. 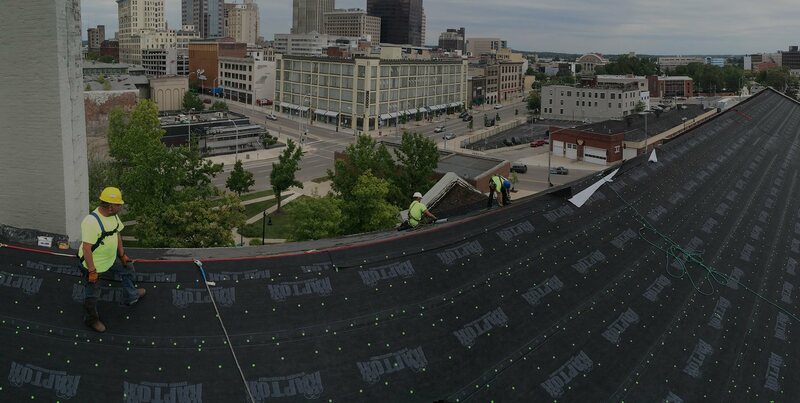 Above all, dedication, integrity and the embracing of new technologies and building practices, has made us one of the premier roofing companies in the Midwest. Come grow with us. Seeking quality people to join our flat/low-slope roofing team. No experience necessary! Are you looking for a rewarding career with a growing company that offers opportunities for advancement? Maxim Roofing Company a full-service roofing company is seeking a few good people to join our flat/low slope roofing team. We are looking for both journeymen installers/techs with commercial experience, and hard-working-and-willing-to-learn apprentices with no experience. We are offering steady, year-round employment with almost no travel required. If you are motivated and dependable team player, we want to hear from you! WHY SHOULD YOU WORK WITH MAXIM? At the end of your work day do you want to feel like you accomplished something? Would you enjoy being able to say ‘I worked on that building’ to your family and friends? If so, a job at Maxim Roofing may be the perfect fit for you. At Maxim, we understand quality happens from the inside out. That’s why we have made it our mission to hire the highest quality employees who value unparalleled job safety and stellar customer service. We put safety above everything all else because we value the lives of our employees and their families. We demand the best from our employees, but don’t worry, we reward hard work. From the newly hired laborer to the most seasoned Foreman, we’re here to support you along the way. Along with competitive pay and benefits, we strive to offer our employees with a road map toward a successful career and opportunities for promotion. If you’re interested in joining a company that cares about your personal growth and career advancement, you’ve found it. That’s right, you don’t work for us, you work with us. We are a team of people working together to ensure that community businesses, schools and hospitals have a safe, secure roof over their heads. Think you have what it takes to join our growing roofing team? Apply today! This position is for those (experienced or not) looking to breakthrough in the roofing industry. We are proud to be a company that invests in our employees and ask that, in return, you invest in us. We look for employees who want to put in an honest day’s work and strive to be better than they were the day before. To be an employee at Maxim Roofing, you must be hard-working, customer-driven, safety-minded, quality-focused, and have a positive attitude. The job also requires above average attention to detail and a strong commitment to completing tasks on time. Knowledge of roofing systems is not required as we are willing to train the right candidates. Reliable transportation and the ability to get to and from work is required. Must be able to lift 70lbs or more. Must be reliable and enjoy working outdoors in a variety of climates and NOT have a fear of heights. No experience necessary. We will train. Some of our best and highest-paid employees came to us with no previous roofing experience. They possessed a solid work ethic with a desire to work, learn, and be a part of a team. We advance from within whenever possible so there is a great opportunity to grow in skills, responsibility and income. To be a foreman, you must have a working knowledge of flat roofing and what it takes to run and complete a quality project. We want people that take pride in their work. But more than that, we want a strong team leader with a positive attitude and a respect for the responsibility that he is given. The extent of the responsibilities that are given to our foremen are dependent on their skills, capabilities, attitude and proven work history. Those things also determine the rate of pay that we can provide.